FC Ryukyu have announced the loan signing until the end of January next year of Vissel Kobe's Wataru Nakazato ahead of their participation in the Regional League Championship Winners Play-off. 20-year-old Nakazato is a former captain of Kobe's reserve side and a speedy overlapping defender with a good line in free kicks. His new colleagues down Okinawa way include Brazilian duo Christiano and Da Silva and ex-Shimizu S-Pulse and Tokyo Verdy 1969 defender Tadaaki Matsubara. 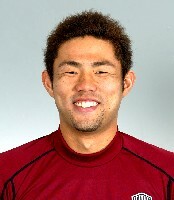 Ryukyu ended up second in the 2005 Kyushu League table, having been promoted from the Okinawa Prefectural League at the end of 2004 on a wave of optimism, tinged with the fear that they too could collapse in the same way that previous local big guns Okinawa Kariyushi had done, following their failure to achieve promotion to the JFL under the guidance of Ruy Ramos. Having pilfered a fair number of Kariyushi players, Ryukyu went on to offer the nearest challenge to Rosso Kumamoto - and indeed, if they'd managed to beat Rosso on the last day of the season would actually have won the title. But a 1-0 defeat still enabled them to qualify for the play-offs and so keep alive their dream of bringing a higher level of football to Okinawa. Standing in their way at the end of November are Kanto League champions Luminozo Sayama and surprise winners of the Chugoku League, a side representing a big distribution company, Sagawa Kyubin Chugoku. The former have a fair degree of experience at this level and in fact twelve months ago only just missed out on a place in the JFL when they lost 3-1 to Ryutsu Keizai University in the final match of the play-offs. Sagawa Kyubin, meanwhile, are generally a young side made up of players from universities and high schools around Hiroshima, but on the other hand their parent company are well represented in the JFL already via Sagawa Kyubin Tokyo and Sagawa Kyubin Osaka.